WASHINGTON—Armenian National Committee of America (ANCA) Executive Director Aram Hamparian issued this response to President Donald Trump’s failure to lead an honest American remembrance of the Armenian Genocide in his commemorative statement issued earlier today. President Trump’s ‘Turkey First’ approach tightens Erdogan’s grip over U.S. policy on the genocide of Armenians, Greeks, Assyrians and other Christians. 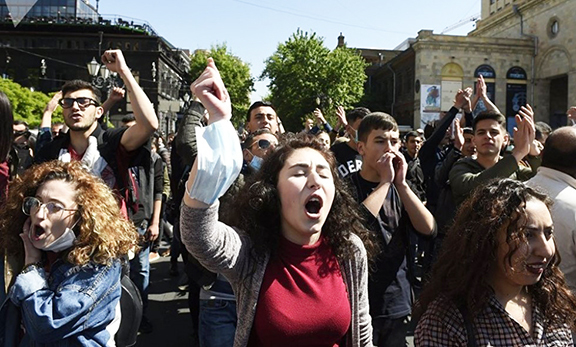 In his annual April 24th statement, the President once again enforced Ankara’s gag-rule against honest American condemnation and commemoration of the Armenian Genocide. In outsourcing U.S. leadership on genocide prevention to Erdogan – who openly undermines U.S. interests, attacks U.S. allies, threatens U.S. troops, imprisons American clergy, and even orders the beating of American citizens – President Trump is emboldening a foreign dictator who revels in the public spectacle of having bullied successive American presidents into silence on Turkey’s still unpunished murder of millions Christians. Sadly, by caving in to Turkish pressure, President Trump is isolating America, which today stands alone as Ankara’s last genocide-denial lifeline. Forty-eight of our U.S. states have recognized the Armenian Genocide, as have a dozen of our NATO allies – including France and Germany, the European Union, and, of course, Pope Francis. We will press ahead with our work to end U.S. complicity in Ankara’s obstruction of justice, in order to put in place a U.S. policy that actively pressures Ankara to abandon its denials, reckon with its responsibilities, and engage directly with Armenian stakeholders toward a truthful, just, and comprehensive international resolution of this crime against humanity. The President’s full statement is provided at the end of this news item. President Ronald Reagan reaffirmed the Armenian Genocide in 1981. The U.S. House of Representatives adopted legislation on the Armenian Genocide in 1975, 1984 and 1996. Forty eight U.S. states have recognized the Armenian Genocide through resolution or proclamation. Over 25 countries have recognized the Armenian Genocide, including a dozen of our NATO allies the European Union, and, of course, Pope Francis. Genocide deniers are beneath contempt. I know this opinion probably won’t get published because the editors are in California, and and will not accept an Armenian having a view that is ultra-liberal or showing utter disdain of Trump… so enjoy editors! No fan, but just an apologist for Trump! We continually look for our presidents to have the integrity to call what our families and friends have suffered “Genocide”. The candidates seem to support our cause when they are running but back off when in office. When did we as a country and a people lose our moral compass? When did we who are Christians and call our great country a Christian nation turn our backs on what Jesus taught? We are losing our humanity by cowering in a corner for fear Turkey may make us abandon our military bases. Power and greed entice our leaders to make a pact with the devil. It’s time we make sure our candidates publicly state that Turkey is guilty of Genocide before we even consider giving them our support as Americans of Armenian descent. Whether we supported presidents in the past or the present, we need to pressure all our elected leaders as well as those who have their eyes on a position in government that we are a voting force to be reckoned with and will not stand by while our history gets “rewritten”. Big loser, lier, didn’t expect anything from this moron! Birds of a feather, fly together! Trump and Erdogan are one and the same in nature. It’s very unfortunate that many Armenian Americans voted for Trump. Although, Mrs. Clinton would not have changed much, either. Let’s face it, American foreign policy is governed by American corporations which do not want to lose out on their sales to Turkey. What the West does not see is that today’s Turkish wealth is built upon and stolen from Armenians., albeit our lands or confiscated goods. The continued current American policy bring shame to our nation and stains our reputation as good and genuine people. It was the sole responsibility of serj sargsyan to take turkey to ICJ – International Court of Justice , since United States recognized The Armenian Genocide in 1951 , and most of you can do research why serj did not want to take the turks to ICJ due to his business ventures with the turks doe sit get any simpler . President Trump, I voted for you to become President but I assure you I will not vote for you again unless you recognize and accept the Armenian Genocide of 1915 and so state it precisely those words that the Armenian Genocide of 1915 was the first genocide of this century. Trump’s denial of the armenian genocide negates his slogan to “make america great again” when Turkey is conducting and controlling U.S. Policy. This makes me doubly proud to be a Canadian armenian!. Just about every US president has acknowledged the Armenian Genocide since WWI one way or another. They know quite well what happened in 1915. What is keeping the US from officially recognizing the Armenian Genocide and to hold criminal Turkey responsible for it are foreign agents who have infiltrated the US government over the years and have hijacked and are dictating US foreign policy in the region. The genocidal Turkey of course is always in panic mode when the Armenian Genocide subject comes up anywhere in the world because those are the TRUE sings of a guilty nation. This Turkish reaction is further demonstrated when they start warning and blackmailing those who try to expose the truth, the US in particular, and threatening to closes bases and such. Innocent nations don’t react this way. They know they stand to lose alot, from reparations in hundreds of billions of dollars in stolen Armenian properties and assets to murdering innocent lives and onto losing occupied Armenian territories illegally and criminally taken from the Armenians as a result of the Armenian Genocide. The United States has long lost its moral compass because US is not a country in the traditional sense. It is a gigantic corporation and those who finance it are those who decide its policies. And many of those people only care about themselves and the interests they secretly represent. The rest are slaves to their wills. I don’t know how important it is that US does officially use the word genocide or not because it has already been done. What’s important here is Turkish accountability for this crime and I’m afraid that won’t materialize until genocidal Turkey is no longer in the NATO alliance using it to shield itself from accountability through threats and blackmail. As far as Trump is concerned, well he is nothing more than a Real Estate agent, a wheeler and a dealer, and the most important thing to him is the bottom line. You can not and should not expect anything more from such morally-bankrupt man with a single-digit IQ on world affairs and politics. He can barely form a sensible statement worthy of a president. This guy is clueless. Even he himself was surprised he was elected president. The fact that he was elected president speaks very little about his qualifications but more about his racist manipulations of the public who were easily deceived by his divisive and insulting rhetoric. He is an insult to American intelligence!